Evernote is one of the hugely praised note taking services. Microsoft’s OneNote is also among the mostly popular pieces for the same purpose. Both of them support wider range of devices. Recently I’ve tried Evernote vs OneNote web version and made a comparison table for you. Hope it will give you more understanding regarding these two products and help you make a right choice. So from our Evernote vs OneNote comparison we see that they offer almost similar sets of features on their web versions. Both of the services are available on a wide range of platforms. OneNote introduces it notes as ‘Notebook’ which inherits some additional benefits like inserting new pages, sections etc. Both of the services have free and paid packages. Premium OneNote comes with Office 365 plans which starts from $9.99 per month. There is a one month free trial available. On the other hand, Evernote premium plan costs $5/month or $45/year. OneNote home page is clear and simple. It sports a default grid view. Evernote offers a three column list view with lots of options and shortcuts on the welcome page. Still it is well responsive and smooth. When it comes to note editing and formatting tools, I found OneNote more flexible and feature rich. In the above table you can get the proof. OneNote has better customization facilities than Evernote. Surprisingly, there is no reminder or custom arrangement option in OneNote web app. Evernote provides these features. Evernote offers an add-on called ‘Evernote Web Clipper‘ for browsers which enables quick note taking while browsing the web. In contrast, Microsoft OneNote has an independent tool dubbed ‘Send to OneNote’ that comes handy to capture screenshots and take quick notes. If you’re interested in Evernote, I’d recommend you to read Jeremy Roberts’ book called Evernote Every Day. It will bring you to a new level of using Evernote through a series of practical, easy to follow guides. Another book that you may find interesting is Evernote Essentials by Brett Kelly. Everybody who buys this book gets all future versions, free of charge, for the life of the product. However, summing up, I liked both Evernote and OneNote web apps. Did you use them? Which one did you like? Onetastic for OneNote: Why You Need it? Why Evernote is so popular? Good comparison! What do you mean by custom arrangements or shortcuts? I think OneNote can offer both, but I may be wrong depending upon how I interpret your statements. One thing that OneNote can do in place of reminders is integrate with Outlook which will allow you to set up a task in OneNote (with a reminder) that is synched to both. Thank you for your comment. In this article, I compared the web apps of Evernote and OneNote. Currently, the OneNote web app automatically arranges notebooks in alphabetical order. In OneNote web interface (home), there is no custom arrangement option using filters like tags, modification dates and so on. In Evernote, there is a ‘Shortcuts’ section located on the top right corner of its web app’s homepage. Users can drag notes, tags or notebooks to make a shortcut for quick access. You know, such quick access shortcuts may be helpful for those who have lots of notes but some of them are frequently accessed. OneNote web app does not allow adding a reminder. Evernote web app offers reminder. I simply compared it from the Web App aspect. OneNote users may get reminders in other ways however, but not yet in OneNote web app. It should be noted that the premium subscription for OneNote is actually for Office 365, so it also gives you access to Word, Excel, PowerPoint Outlook and the rest of Office on PC, Mac, iPad, Android, and so on. The $9.95 price is the “family” one that gives you five installs on PC/Mac and another five installs on tablets and phones. There is a $6.95/mo option for individuals that allows two installs each. A great value compared to a subscription for just one app. Conversely, if you have Office 365 already, then you also have premium OneNote. I noted it in the article. Premium OneNote comes with Office 365 subscription plans which starts from $9.99 per month. There is a one month free trial available. OneNote premium offers some more features (like better Office integration, offline access, business features). I’ve been looking to move over to Onenote because of the ease of use on the pc, plus the automatic versioning. However, the web app has held me back. I use the web apps more than the pc software and not being able to set reminders on projects I’m working on from the app is a huge negative for me. Another, lesser, negative is not being able to clip a webpage to a specific notebook…It’s a quick fix to go into onenote and send it from quick notes to the correct notebook, however, my evernote webclipper gives me the ability as I am clipping, even on Android and iOS. Would love for Microsoft to make their onenote apps stronger. Is this specific to the webapp? I know when I clip something using OneNote it pops up a screen to let me drill down into my notebooks to place it. Maybe that’s just the pc version?? Have you seen the OneNote add-on Onetastic? It has a lot of good additional features. For me the main difference is the internal organization. OneNote has tabs on the top and on the side, so for a complex project I can organize the content without it all being in one place. As far as I can tell, Evernote doesn’t do that. I use Evernote for simple note taking and OneNote to organize complex content. Thanks Ellen, it’s an interesting view. I began using OneNote in 2004. I used it because it worked like Outlook Journal of steroids. In 2009 I switched to Evernote because I could use it on my windows, then iphone, and now android smartphone. I used BPOS but stuck with Evernote but now with O365 is was worth a look. I have over 10K tagged and bagged notes in Evernote so it will be hard for me to move but if you are using O365 Onenote is a no brainer to choose. If you are using something else or used Evernote ofr a long time it is a more difficult issue. IMO the big things Evernote has over OneNote are 1.Speech-to-text function and 2. Integration with browsers. The speech to text is in Evernote is OK to good but OneNote is none to useless. Being able to have a button with Firefox, Chrome, and IE to capture a website is handy. Overall I think OneNote is easier to organize information and the UI is clearer. While I am a Evernote user myself, in my Productivity Consulting and Training business, I have clients who want to know how to maximize OneNote. While you mention that there is no reminder feature in OneNote, if you are using Outlook in conjunction, there really is. When you place a check box by something in a note in Outlook or flag the whole note, it generates a Task. In that Task, you can set a reminder if you’d like. I hope this is helpful for anyone looking to use “reminders” with OneNote notes. Hi Debbie, yes you are right that we can get reminder feature in OneNote if we use “Outlook Tasks”. But this option is not available in OneNote’s web app. We can use Outlook Tasks in OneNote 2010 or 2013. 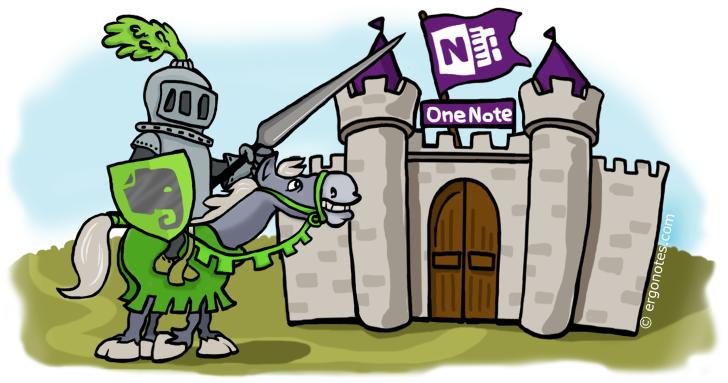 Thank you for taking the time to work up this comparison between OneNote and EverNote. It helped me decide to stick with what I have and know (Microsoft Office 2013) instead of trying to learn a complex new program from scratch… especially since I have a purple thumb when it comes to techie stuff! May I suggest you add a Feedly button to your blog so other former Google-Reader folks can more easily add your blog to their Feedly magazines? Also, it would surely be great if you were to take it into your head to write an article on how to get the most out of Feedly. I got the “pro” version in the hopes it would help me make Feedly do what *I* want *it* to do (instead of the other way around! ), but I’m still struggling. Thank you for the suggestion, we’ve added the button. Hopefully we’ll write the article as well. And if you do decide to write an article on how to get the most out of Feedly, be sure to let me know. Although I can’t believe I’m saying this, I’ve actually learned a few things about it that make a huge difference in how much I enjoy using it. For one thing, I finally figured out how to make the main screen stand still and not scoot over and cover up the left-hand sidebar that contains the list of sites and alerts I follow. Ya gotta click the “PIN” button up at the top of the sidebar! Another thing: I use Google Alerts a lot, so when Google Reader died, I was left with no choice but to route all the alerts I’m following to my email inbox… and what a mess *that* was! But then one of the Feedly Pro techs sent me a link to a video that SpiderWorking made about how to bring Google Alerts into Feedly, so now I’m in heaven… with a cleaner inbox! I should note, though, that an alert won’t load in Feedly if there’s nothing new in it. So I figured out a little workaround — me! — for those situations. I just change the destination of the alert from RSS to email and then, when I get the email, I click on the RSS link at the bottom. The link I get as a result *will* load into Feedly. So there’s actually *two* ways of doing it! The other thing that I *really* want to get out of my inbox are the feeds from the Facebook groups I’m following. I know there’s a way to do it; but, as of this moment, I don’t know what it is. When I find out, I’ll come back in here and let you know. Although it’s been frustrating, trying to get it working right, I can say, now, that I’m glad I stuck with it. It’s wonderful having my very own magazine that publishes just the stuff I like! Feedly enables you to choose whether you want to see your content in the form of three-across large cards, or thumbnails-with-blurbs down, or line-by-line titles only. Better still, it lets you use all three! You can elect to see your favorite blog in card view, the category it’s part of in magazine view, and the whole library it’s part of in list view! And I haven’t even begun to touch on how you can use it in connection with OneNote or EverNote and IFTTT! Here’s how anyone reading this can “Build your Feedly network and increase your repeat traffic” by putting a little green Feedly icon on your blog next to your orange RSS icon! I tell site owners about this wherever I go because, in addition to making it easier for visitors to add a site to their own personal Feedly magazine, it also increases the chances that it will get noticed, enjoyed and recommended to friends. Wow, Elizabeth, I see that you have a good subjective experience of Feedly. I really think that we hardly write such practical review. Why don’t YOU write a small guest post for ergonotes.com about you experience of Feedly. Nothing special just your practical experience… WDYT? FYI: One Note has a collaboration tool with Outlook which can generate a task to set -off reminders. What KILLS me about Evernote is that you can’t resize pictures inside the program itself. You have to double-click and let the picture open it in an external program. That’s a great feature if you actually want to edit the picture, but for resizing? Give me resize handles and let me set it the size I want! Darla, You can resize. I know that is not ordinary, but: You scroll to the end of the picture (down), and after 1 click on it, a little dot in the rught down corner will appear. Just grab it and resize picture. Anyway, One Note has a much more better formatting options. You’ve missed the option for chat and sharing notebooks within Evernote – these are brilliant features for collaboration and teams. Yes, but only in business version. Don’t forget that You can buy Office 2010 key, and has a lifetime licene for OneNote. No matter how we going to count it is a lot of cheaper than EN. b) ease of use of forwarding emails to my evernote notes.